Young Emerging Artist Mitchell Gilbert Messina is set to return to Stevenson this week, with a self-published newspaper residing in the gallery's toilet. It's only been a few days since Messina's last project in the gallery reception area, and the artist is adamant that with each project he inches closer to the main gallery. 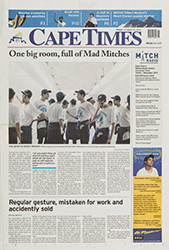 The work, Cape Times Mitchell Edition, is a full-size newspaper in which every article, advert and comic strip is dedicated to the artist himself. 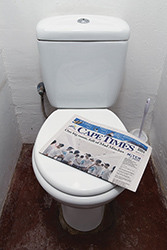 The exhibition will appear in the gallery's toilet, off the back of its international showing as part of the Luma Foundation and 89+'s Filter Bubble. While staff at the Zurich-based foundation remain tight-lipped on whether they cared for it or not, its reception at Stevenson was appreciative: 'I've read some of it and it's not that bad,' said a director at Stevenson. 'It's made up of equal parts hard work and spelling errors,' said another, different director at Stevenson. One thing is certain, this work is testament to Messina's ability to push a one-liner to its breaking point, and beyond. © Copyright 2016, STEVENSON. All rights reserved.